The last batch of fresh apricots crossed my kitchen counter this morning! We had parfaits of home-made granola, fresh apricots (compliments of J & J Orchards, just down the street! ), home-made yogurt topped with strawberry compote. The remaining apricots went into this batch of apricot ginger jam. 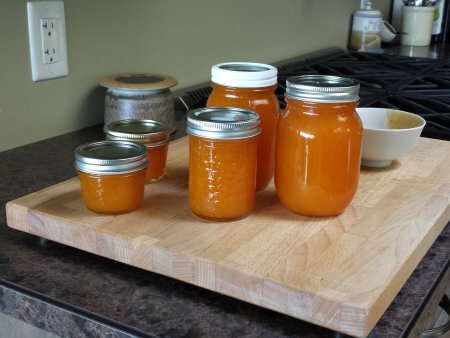 I made apricot ginger jam last year and it was our favorite of the year (closely followed by pear ginger jam!). But this year, for some reason the ginger flavour was not as developed as last year. So I used candied ginger instead of fresh and finally got that crisp biting flavour we both love in apricot ginger jam. You should taste it! Delicious!